What are the Best Interchangeable Knitting Needles of 2019? What are the Best Interchangeable Knitting Needles? When exploring what makes the best interchangeable knitting needles, some knitters place a high priority on material type and affordability, while others are concerned about the number of available cord lengths. But all knitters agree – they want needles that will remain screwed or clicked together while they knit. 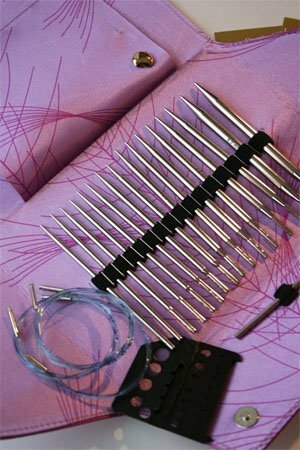 Interchangeable needles are designed to allow you to create circular knitting needles of whatever size or length you need. In order to accomplish this, a balance must be struck between durability and flexibility without designing a product that is too bulky or cumbersome for knitting. The products listed here have found an acceptable compromise and make good interchangeable needles as a result. Why Choose Interchangeables Over Fixed Circulars? Whether fixed or interchangeable, circulars are great because they allow you to knit in the round, knit flat and knit things with larger yarn or a lot of stitches. Fixed circulars allow you to mix and match material types, tips and sizes based on your knitting project, yarn, and mood. What sets them apart is that by having the cables fixed to the needles, there is a low chance of your work falling on the floor – the needle and cable are unlikely to come apart as you knit. But if circulars are so good, why would you ever want an interchangeable? Interchangeable knitting needles are essentially the same in terms of material types, tips and sizes. In fact, you can get an entire set at once, so you don’t need to keep buying needles, like you have to with circulars. But is that all that makes interchangeable knitting needles better? No! Interchangeable knitting needles work exactly like circular knitting needles, but they kick it up a notch. To knit with an interchangeable knitting needle, you simply combine two needles and a cable by clicking or screwing these items together. Accessories include connectors, end caps, pins and grippers (fully explained below). When looking for the best interchangeable knitting needles, it is important to find one that is right for you. With the versatility of interchangeables, a few needle combinations won’t limit you. What do you want to knit? What yarn will you use? Are you a beginning, expert, or just-having-fun knitter? Whatever the case, interchangeables needles may be the perfect choice for you. Interchangeable needles come in your choice of materials – wood, bamboo, aluminum, carbon fiber, plastic, and stainless steel. Manufacturers don’t mix and match different needle materials in the same interchangeable set. However, if the connection between the needle and the cord matches another set’s connection, it may be possible to interchange needles between sets. This means you could use an aluminum needle with a cord from a bamboo set or even use a plastic needle and a stainless steel needle at the same time. Needles come in short tips, typically 3.5 to 4 inches and long tips, typically 5 to 5.5 inches measured from the end of the needle to the cable connection. The tips are available in sharp or rounded options. At the opposite end of the tip, each needle has a connection point for the cable or cord. Most needles screw-in or click-in to the cables. Frustrated with the time consuming activity of threading a lifeline through endless stitches of your latest lace project? Never fear, interchangeables are here! Many interchangeable knitting needles have a drilled hole for threading lifelines. Just insert your lifeline into the hole and start knitting. Your stitches move off the needles and over the cable and lifeline. More time knitting; less time threading lifelines! Win! Win! The cables used with interchangeable needles function the same as circular needles, which is to hold the stitches as you knit. Cables come in plastic or plastic coated steel. The ends of the cables interconnect to the needle tip, the connectors and the end caps. Like many circular knitting needles, some interchangeable knitting needles have a swivel cord. Rotating 360 degrees, the swivel cords stay kink free while you knit. When 60 inches will not do, you can add more space for your stitches by connecting cables together. Most sets come with these nifty little gadgets that allow you to knit afghans or blankets all in one piece. Knitting with chunky yarn or roving? Connect multiple cables and give yourself a break while those extra-long cables do most of the work holding the heavier yarn. Taking point protectors to a new realm, end caps add even more versatility to interchangeables. Instead of connecting a needle at each end of a single cable, place an end cap at the opposite end, changing a circular needle into a flexible straight needle. Use end caps for holding stitches onto the cable when switching needles or when trying on a garment for fit. Can’t wait to get started on that new skein of cashmere and your needles are stuck in another project? Oh no! But wait. Just push the stitches onto the cable, remove the needles, add end caps to the cable and start unwinding that cashmere because your next project is off and running! Although needles and cables connect together, some manufacturers provide a small wire pin or key to help with tightening the connection. The pin doesn’t actually tighten the screw, but it gives you leverage as you tighten the needle to the cable. If you lose things easily or if you don’t want to mess around with extra parts, look for interchangeable knitting needles that click together. To get a good grip when you want to tighten or take apart screw-type interchangeable knitting needles, rubber-type grippers help you with this task. Simply place one gripper over a needle and another gripper over the cord and twist the two parts in the opposite direction. Our list of 5 needles includes some of the most popular and acclaimed interchangeable needles currently available. We evaluated them according to the key critera listed in our buying guide. 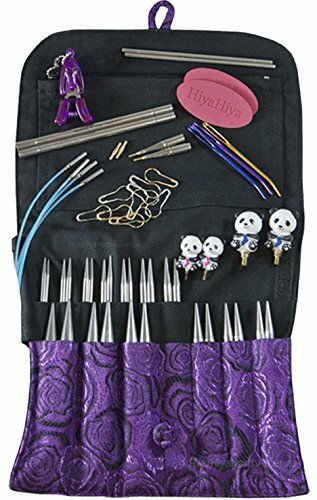 The HiyaHiya Interchangeable 4-inch (10cm) Sharp Steel Knitting Needle Set brings a variety of pleasures to your knitting table. Made from stainless steel, each needle comes with a hole for that all-important lifeline. Additionally, swivel cables prevent curling or twisting of the cable as you knit. The pointed needles screw into the cables. Use the grippers provided in the case to tighten the join between the needle and the cable. 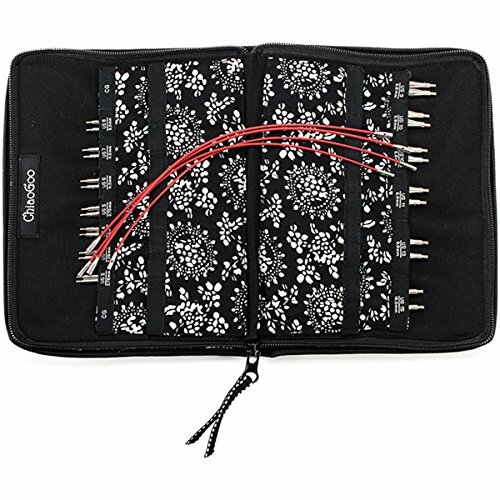 The Chiaogoo Twist Interchangeable 4-inch Knitting Needle Set offers a wide range of needle sizes. Made from stainless steel, each needle has the size laser etched for easy-to-see sizing. All needles have a drilled hole for a lifeline. Memory free cables made from twisted steel with a plastic coating keep your knitting projects kink free while knitting. All needles screw into the cables and this set comes with pins for that extra leverage while tightening the needles to the cables. The only full-line knitting needle manufacturer in Europe, Selter produces quality needles for the most discerning knitter. With the addi® brand of knitting needles, sharp tips, slick surfaces, and quick click connections, keep the most experienced knitter happy for hours. 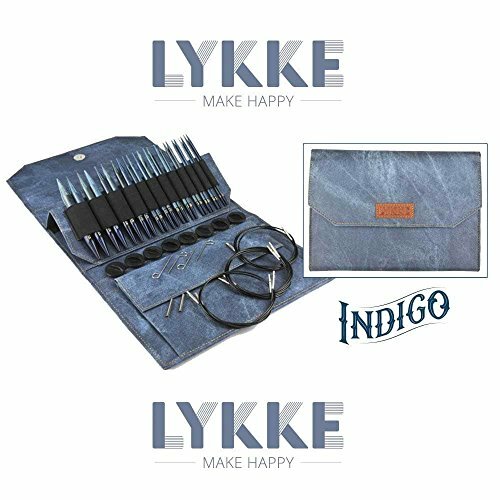 An interchangeable knitting set where less is more, the addi Click Rocket Lace Long Tip interchangeable needle set doesn’t come with pins or grippers as you won’t need them to attach the needles to the cables. Less likely to come apart during your project, the patented click connection creates a smooth join and less snagging of yarn. 5" Driftwood Interchangeable Gift Set in Indigo Pouch. Made from strong birch wood, Lykke Driftwood interchangeable knitting needles give new meaning to eco-friendly wood needles. Warm-to-the-touch wood needles work well with slippery yarns like silk since they grab the yarn. The screw-in needles of the Lykke (pronounced Luu-kuh) set have the needle size, in both US and metric, laser etched on the needles. Needle case features a stand that props the needles up, which makes it easier to insert or remove needles from the case. Who wouldn’t want to knit with Fuchsia Fan, Candy Pink, or Purple Passion needles? 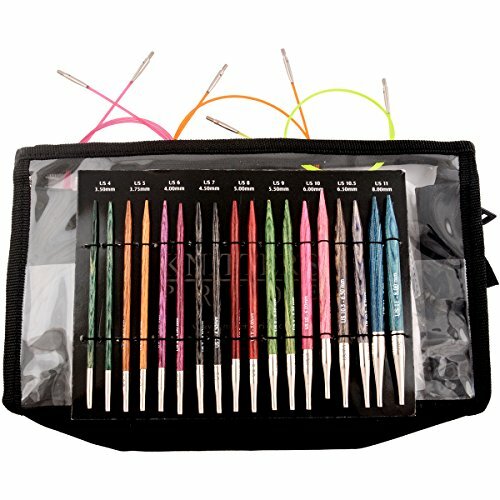 The colorful Knitters Pride Dreamz Interchangeable knitting needles set brings not only a light heartedness to your knitting, but these birch wood needles bring a lighter weight knitting experience as well. Sizes printed on the needles may wear off over time, but the numbers are etched on the metal end and each needle size is a different color so this may not be an issue for most knitters. If you have any issue with hand fatigue or soreness while you knit, these screw in wooden needles may be a solution for you. It can be hard for beginners to select the ideal interchangeable knitting needle. There are too many features and styles to sort through. Your best solution might be to ask an experienced knitter which interchangeable will work for you. The sooner you find one, the sooner you’ll see how much the best interchangeable knitting needles can make you want to knit. What are the Best Knitting Needles for 2019? What are the Best Interchangeable Knitting Needles for Beginners? What are the Best Knitting Needles for Blankets?